We moved onto the boat Thursday! ... But while I was stepping down into the cockpit carrying things, I sprained my ankle. 3rd degree. Full separation of ligaments. It swelled up to the size of two baseballs in less than a minute. AJ freaked at the sight of it and rushed me to the ER. He was afraid I had broken a bone. But, only the ligaments are torn, and I am in a cast and on crutches for a few weeks. This is my second 3rd degree sprain in 2 years. So now that I'm on the boat I won't be getting off the boat any time soon. I'm devastated. In the ER the nurse gave me nausea medicine because I kept turning white. But it was't pain that kept causing me to look like I was going to vomit. I was getting hit with wave after wave of catastrophizing thoughts. The reality of being in a hospital instead of kick-starting our lives on the boat was crushing. We may not even make it out this season. I'm having a hard time dealing with the fact that my bum ankle is now going to be even more of a bum ankle, and will possibly need surgery to re-anchor the ligaments. I can't be hearing this right now. I want to put my fingers in my ears and sing "LaLaLaLaLaLa". Back in Arkansas AJ and I got fortune cookies one day. I wish I'd taken a picture of them. His said something about it being wise to reconsider plans, and mine said "Something with 4 wheels is a wise investment." Combined I think the message was clear. Sell the boat and buy a van. Now those words will haunt me. I will dream of wheels, and hear the word reverberate in a ghostly echo every time I see the hatch that sprained my ankle. wheeeels wheeeeels wheeeeels.. But back to the boat. We're still not giving up regardless of what wise little cookies say, and regardless of the injuries incurred not listening to them. Most work is inside the cabin now, so I shouldn't be entirely useless. I will still be able to screw up wire clamps and the like. I just won't be able to go get a screwdriver from the shed. .
Before moving on we dropped the stove in the well and AJ will run propane to it soon. He also plumbed the sink drain to a thru hull. I can't believe he was able to get through that hole! One shoulder at a time. 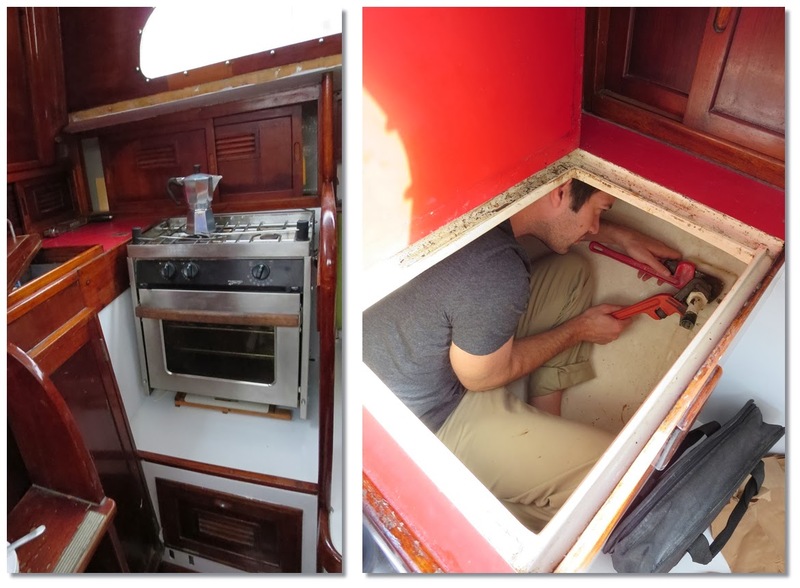 He's in the locker to the the left of the stove. .
We abandoned the Reflectix insulation and vinyl project in the main cabin, but we kept it in the V-berth. The v-berth ceiling was rough fiberglass with multiple layers of chipping gel coat and paint. We peeled the top layer of latex paint off with our fingers and sanded as best as we could underneath before gluing up the Refletix a few months ago. We started on the vinyl before we went back to AR. This week we finished the vinyl with batons, installed the shelves and sheeted the mattresses. We have a bedroom. With a nice smooth wipe-able ceiling, that hurts a little less to bump your head on. Now it's hard to know what to do next! Propane to cook? 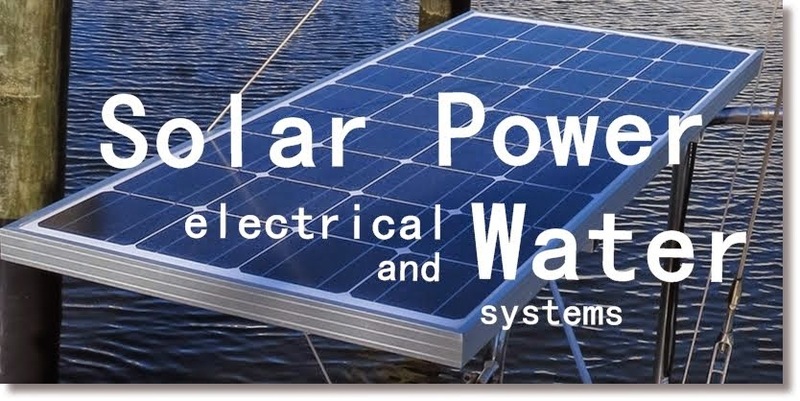 Solar panels and wiring for light? Water tanks and plumbing? 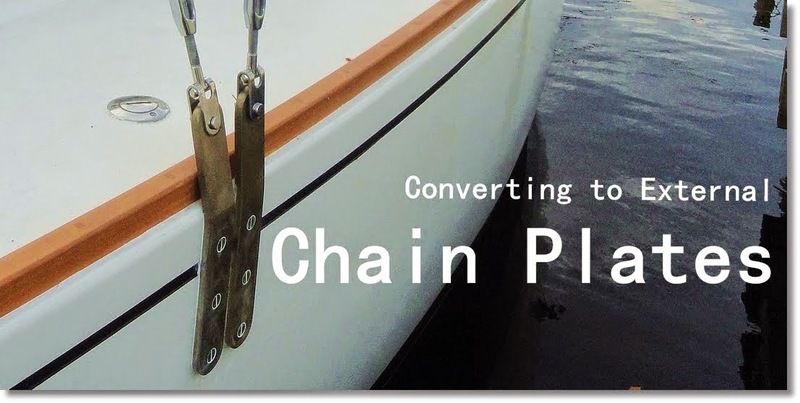 Templating trim pieces to finish out the cabin? Templating new shelves and counters? Making replacements for old bad shelves? Building a table? There really isn't much prioritizing any more. It all needs to happen. We have nothing but a working toilet and power cord running from the dock for electronics and a night lamp. 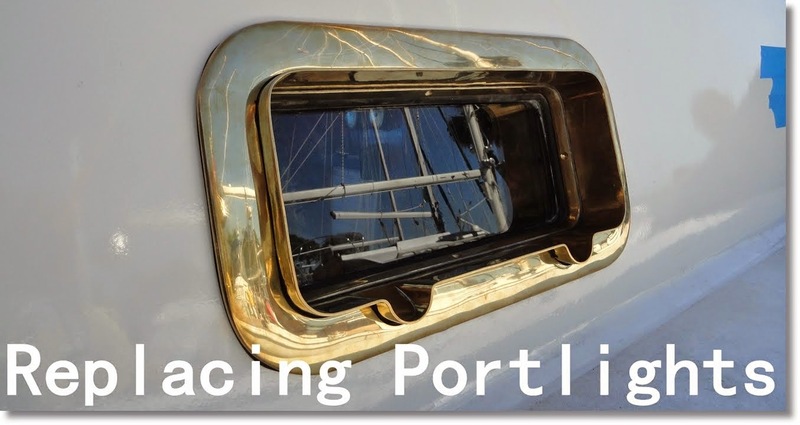 I figure the needs of living aboard will dictate what happens when. Showering was the most problematic situation we assessed before moving aboard. We planned to sponge bathe or hose off clothed with the dock hose until the water and propane are hooked up, but last night AJ rigged a temporary solution. We have a portable propane on demand water heater/shower waiting in storage. AJ hooked it up to the propane in the cockpit, and to the water hose from the dock. After dark he took a hot shower in the cockpit with a hanging tarp. It's pretty nifty. The starboard side of the boat is empty and waiting on cabinets and counters. I drew a rudimentary overlay of what we plan to do to the old icebox area. The recessed counter will allow us to step into the space and access the back corners. The two doors represent cabinets for storage of pots and pans and what else. The top opening door is where we will build in space for refrigeration. Which we will obtain eventually. 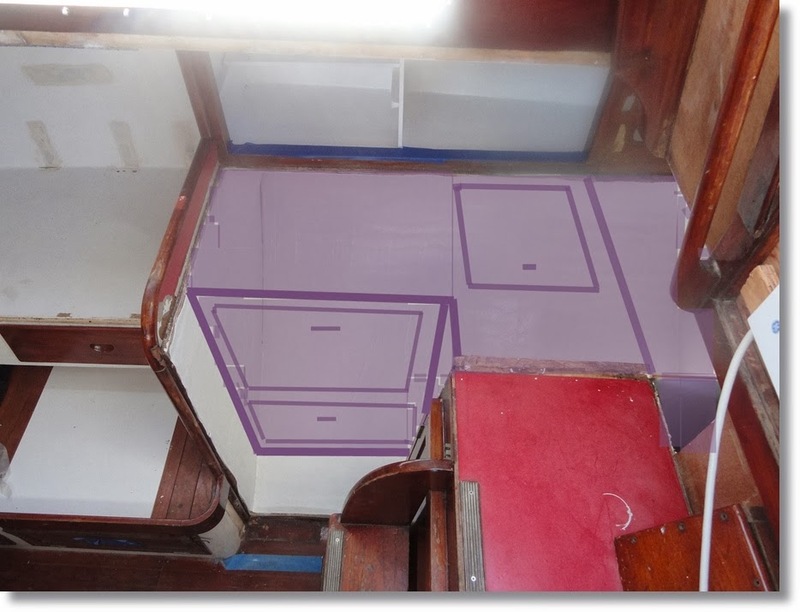 There will be a lip on the top of the counter separating the left from the counter that is recessed under the companionway/cockpit. That space will hold navigation equipment. Beneath it, against the back wall behind the refrigeration foam, a water tank bag will hang and be plumbed to the galley. Massive storage, refrigeration, and 20 gallons of water will all fit in what was nothing but a huge box of old foam. I'm glad we removed it. This is going to be nice! 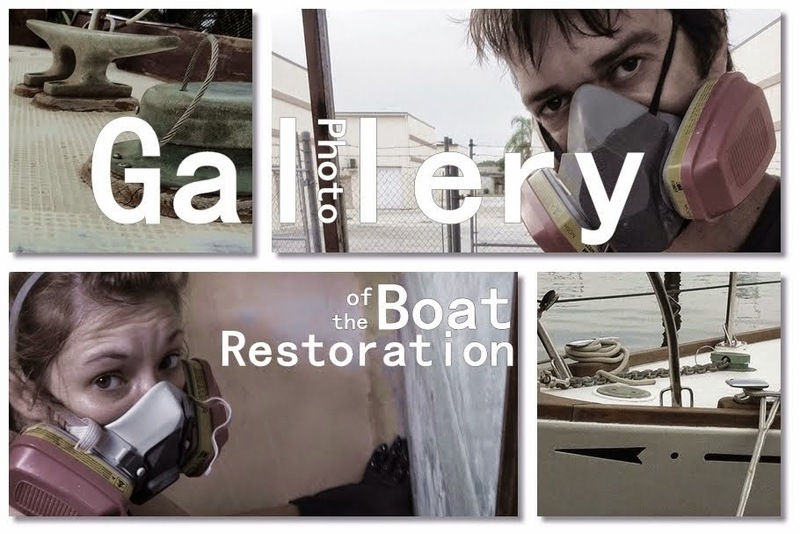 The starboard salon is also being redone. Here is a pic of the cabin in it's original state. The bay behind the settee was once a berth, but someone had already built in a navigation cabinet and shelf to utilize the space better. 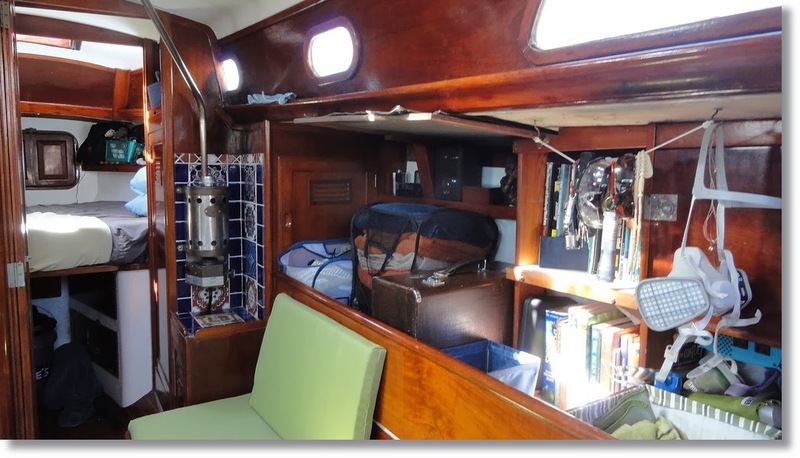 It is the main accessible storage in the cabin, and a lot of space is wasted with it being open. 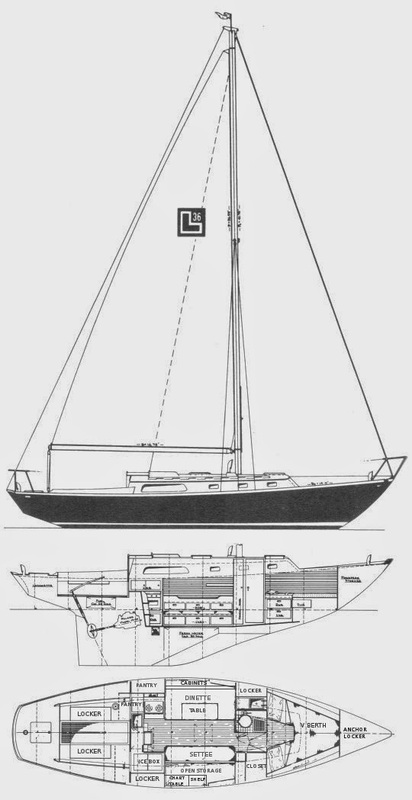 And everything would have to be tied down while sailing. So we decided to build cabinets. We will keep the nav cabinet up high on the right with an open bay below, then fill the rest of the space with new cabinets. We removed the front panel a while ago, and prepped the area. Note the door at the end of the bay next to the tiles in the picture above. That door is blocked whether the storage is open or closed. So it was removed the wall all together. It will become a recessed closet in a cabinet - Something like this. 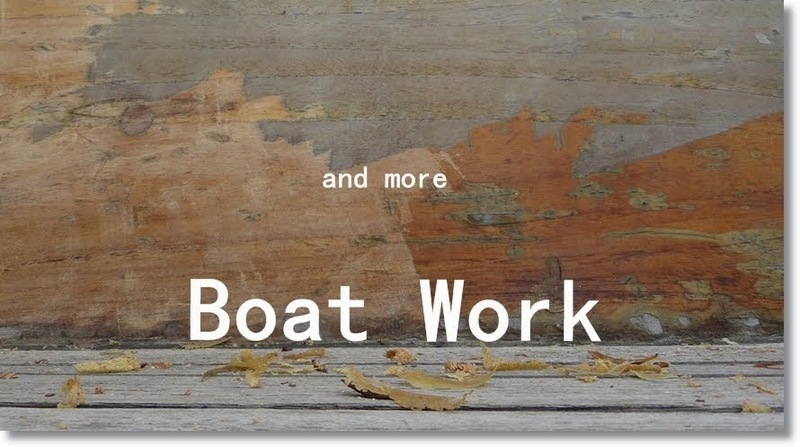 With the new starboard salon storage and the new galley cabinets, we'll have more storage than we know what to do with. After a couple years of discussing what to do with spaces over coffee, I think we have decided on plans that maximize storage and accessibility. I'm really happy with what we've come up with. There are more exciting details, like spice storage solutions but we'll get to that when we get to it. God I can't wait for spice storage solution time! Then you know you've made it. When your're organizing spices, you're home. The port side of the cabin is now put together, minus a couple cushions that would be in the way right now. We need to build a new table for it. How to make the table has been another ongoing topic of debate, and we have found a happy solution, but more on that when we make it. And that about wraps up the state of things. See ya next time. So sorry to hear about your ankle! The boat looks beautiful. Get well soon! So sorry about the ankle, sorry you inherited my weak ankles. I did the same thing last August stepping down from the shop door to the ground carrying things and it swelled up like 2 baseballs, too. I wore a walking cast for about 3 months. Then the lace up boots. I have just started trying other shoes. It still aches some. I read that surgery usually isn't recommended unless you are young and an athlete because it will heal, it just takes 6 months to a year. I was in pain for about the first month. The walking cast was great - we actually found one as Marva for $5 after we decided not to take the $150 one from the Dr. I'd send it to you if I thought it would fit but I am afraid it would be too big for you. Boot News is GOOD. Your cushions look like ours (except cleaner)! Nice color choice! I am continually amazed at your tenacity and craftsmanship. Wish you were going to be over on the Pacific side so we could run into when you shove off! Keep on keeping on, we're rooting for you. Hope that ankle heals quickly!